JERUSALEM (Ma’an) — Two Palestinian families in the occupied East Jerusalem neighborhood of Beit Hanina were forced to demolish their own homes for being built without licenses on Wednesday, in order to avoid the expensive demolition fines imposed by the Jerusalem municipality when its employees carry out the demolition themselves. Between the two families, 15 Palestinians were displaced as a result of the demolitions. Owner of one of the homes Imad Jaber told Ma’an he was forced to rent a bulldozer to demolish his house, after receiving an order from the municipality. He said there was no way he could afford the fee, especially after he has paid 67,000 shekels ($17,885) in fines to the municipality over the last few years. He said he lived with his wife and four children in the house, for which he has continuously tried to obtain a building license, but the municipality has continued to reject his application. 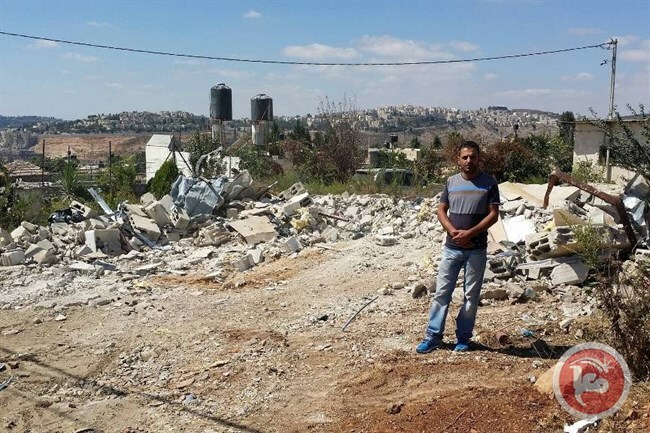 Meanwhile, owner of another Beit Hanina home Rami Allon was also forced to demolish his house in recent days following an Israeli court order. He told Ma’an that he was injured during the demolition, when one of the house’s support columns collapsed on him, causing three different fractures in one of his legs. Allon said that he has been living in the two-storey, 340-square-meter house with his wife and seven children since 2013. He added that the municipality ordered him to pay a 117,000 shekel ($31,098) fine when he first built the house in 2013. He told Ma’an that he paid the fees in hopes that the municipality would not demolish the house, and also filed multiple appeals to the Israeli central and supreme courts against the demolition, but they rejected each appeal and ordered the demolition to be carried out anyway. Allon noted that he owns three other houses in Beit Hanina for which he is trying to obtain building licences, and each of the houses have been incurring fines from the municipality. In response to a request for comment, a spokesperson for the Jerusalem municipality told Ma’an they could not confirm the case of the Jaber home due to lack of sufficient details.